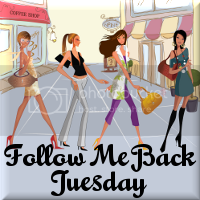 Quite excited to be joining Follow Me Back Tuesday again! Passing through from Follow Me Back Tuesday to say hello! Have a great day. hey nice blog. I am ur newest follower & I hope u follow back too! Stopping by from Follow Me Back Tuesday. Great site. I like your style. Following you now. I will be back! New follower from Tuesday blog hopping. This one's nice. Would love to join this one.